There are many ways to gain retraction today for final impressions. With all those options I still find that a two cord technique creates the most predictability in my hands. One of the challenges with a double cord technique is the removal of the top cord when there are multiple preps to impress at once. A technique I learned many years ago of using a continuous top cord makes this step much simpler. 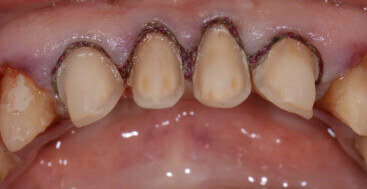 This technique is designed to be used with veneer preps, and can not be used if the preparations include the lingual surface of the tooth. After placing a single, separate initial cord around each veneer prep, decide what size top cord you will be using. You will need a spool of cord for this procedure instead of the single use, pre-cut version. Dispense a healthy amount of cord, roughly around 1/2 inch for each veneer prep to be impressed. Starting on the distal lingual line angle of the prep farthest to the left leave a small 1/4 inch tail and begin placing the top cord inside the sulcus. The top cord should be fully visible all the way around the prep. ant area where the cord is placed deep enough that the tissue has covered over it will not be captured adequately int he final impression. Continue to place the cord until you are just lingual to the mesio-lingual line angle of the tooth and then wrap the cord to the facial and begin to place it on the disto-lingual line angle of the next tooth. Much like a continuous suture, the cord will be one piece and extend from the disto-lingual line angle of the left hand veneer prep to the disto-lingual line angle to the veneer prep farthest on the right. In each interproximal it will simply sit on top of the interproximal papilla. When you are ready to take your impression. Moisten the top cord, and with cotton pliers find the tail. The cord can now be pulled as one continuous piece off all of the preps. Following removal of the cord thoroughly dry all of the preps and then inject the light body impression material.